Now we know the “whom.” Sports media company, theScore Inc., announced today that it would launch a New Jersey sports betting app sometime next year. 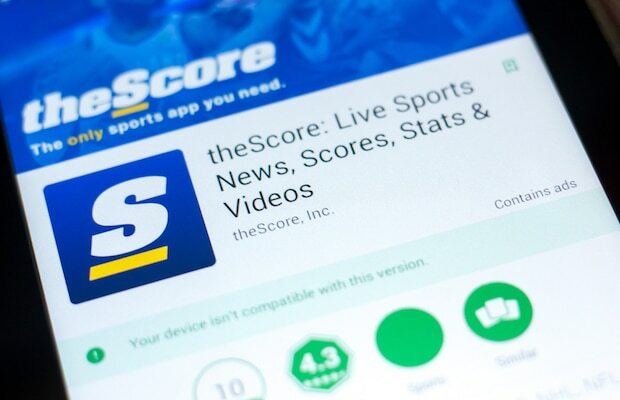 “This is a transformational moment for theScore, becoming the first media company in North America to announce its plans to launch online and mobile sports betting in the United States,” said John Levy, founder and CEO of theScore. TheScore is a publicly traded media company that offers sports scores and news through its app and websites. The plan to get into sports betting for a media company on the operator side makes a lot of sense considering the reach of content and magnitude of theScore. Its land-based sports betting partner, Monmouth Park Racetrack, has terms set forth of up to 15 years, consisting of an initial term of five years, which is extendable for two successive five-year terms at the option of theScore. The sports betting app must be approved by the NJ Division of Gaming Enforcement. TheScore anticipates a launch in mid-2019. While it wasn’t entirely clear how theScore would make its sports betting entry, it’s not a shocking endeavor for the company. The company announced this summer that it landed iGaming veteran David Wang as a senior advisor. Wang is also the CEO and founder of Bet.Works and has worked on online gaming and sports betting as a senior executive for both US gaming giants MGM Resorts and more recently Wynn Resorts, where he led the launch of both mobile sports betting businesses. “This quarter also saw the legalization of sports betting in the United States, which presents an exciting opportunity for us. The state-by-state roll-out of this, and the different models being explored within each individual state, means the US sports betting landscape remains a fluid one. And while the entry point is in NJ, the company has designs on getting into other states. Those plans remain unknown, but rumors point to more states to follow in short order, says one industry insider with knowledge of the roll out into the US. TheScore boasts more than 4 million active users for its sports app, and a database larger than that that could be activated for sports betting purposes, once states start going live. Reached 50 million sports fans on their social and emerging platforms in the third quarter. Has 1 million Instagram follows and 3.4 million Facebook followers. DraftKings Sportsbook and FanDuel Sportsbook have done well in the early days of the NJ sports betting part because of their existing databases of users and their brand recognition. The two companies combined for two-thirds of all sports gambling revenue in the state in November. However, theScore represents a serious challenge to the incumbents due to its loyal, dedicated user base. TheScore users and engagements indeed surpass those of the two daily-fantasy-sports-turned-sports-betting operators. The hope is that it can quickly do well in the NJ market and others, if and when they enter new states. Beyond NJ, online sports betting is only legal in Nevada, Pennsylvania and West Virginia. Online betting launches are still pending in the latter two states.